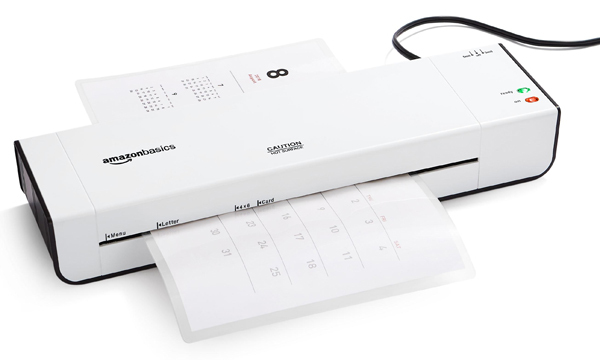 2 heat settings for 3-mil or 5-mil laminating pouches (The laminator’s 3-mil heat setting works best for everyday documents, photos, and card stock, while its 5-mil heat setting comes in handy for thinner papers, providing a thicker lamination). Wait 4 minutes for the laminator to heat up. Once the laminator's "ready" light displays green, you may start to use it. Place the item you want laminated in the appropriate size pouch. Line the pouch up with the lines displayed on the front of the machine, with the seam of the pouch going in (see photo on front of machine). Next, gently feed the pouch into the machine. When finished, push the power button to the off position.